This article is in collaboration with The Dylan Ratigan Show’s “Mad As Hell” series. WASHINGTON — A multinational oil company will be coming to the Supreme Court this winter to argue that corporations are not “natural persons” and therefore cannot be held liable for committing international human rights violations such as torture, extrajudicial killings and crimes against humanity. The case, Kiobel v. Royal Dutch Petroleum, began far from Washington in the Ogoni region of the Niger Delta. 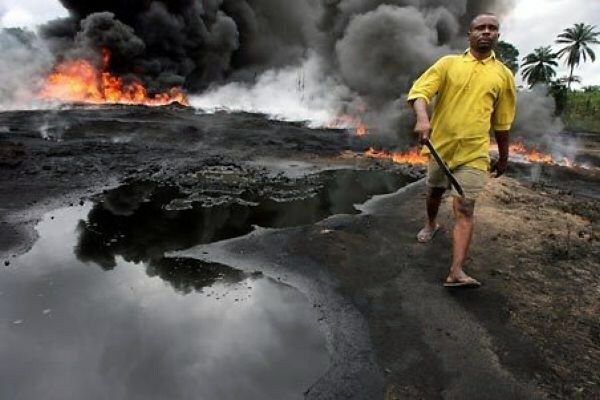 About a dozen Nigerians contend that Shell Oil’s parent company aided and abetted the Nigerian government in its violent suppression of environmental and human rights protesters resisting Shell’s operations there in the 1990s. In September 2010, the U.S. Court of Appeals for the 2nd Circuit accepted the oil company’s argument that as a corporation it’s immune from being sued in the United States for the overseas conduct. Since then, three other appeals courts, looking at the same law, have held otherwise — in cases brought against Exxon, Firestone and Rio Tinto for similar alleged atrocities. At first blush, the idea that corporations are not people under the law sounds perplexing. Didn’t the Supreme Court decide almost two years ago in Citizens United v. Federal Election Commission that corporations have the same First Amendment right to fund political speech as natural persons? If consistency counts for anything, shouldn’t corporations take the same responsibility for their wrongdoings? At least in theory, they do: Under Anglo-American law, corporations have long been considered legal persons subject to suit. But the 2nd Circuit in Kiobel held that this country’s history of corporate liability is irrelevant when it comes to a founding fathers-era statute that allows foreign nationals injured by “a violation of the law of nations” to sue in U.S. courts. The Alien Tort Statute, passed by the first Congress in 1789, says the federal trial courts can hear any civil suit brought by a foreign national “for a tort only, committed in violation of the law of nations or a treaty of the United States.” But for two centuries, the ATS lay virtually dormant, its text ambiguous on which torts constitute those committed in violation of the law of nations and what types of defendants — individual, corporate, state — can be sued. It was not until 2004, several decades after the emergence of ATS-related human rights litigation in the lower courts, that the Supreme Court clarified one ambiguity, holding that the ATS can only be invoked for violations of a “narrow class” of international norms that are as “specific, universal and obligatory” as those that existed when the statute was written. The Court gave as examples of those long-recognized abuses the “violation of safe conducts, infringement of the rights of ambassadors, and piracy.” It suggested that torture and genocide clear that high bar, but ruled that arbitrary arrest and detention do not. What the justices have instead are the sharply divided opinions from the lower courts — to which the Court owes no deference — and their own policy preferences. In essence, the justices will be making new law no matter how they rule. Moreover, the appeals courts’ reasoning show how one looking glass can present two opposing realities, with three of the four panels that took on the issue fracturing along the liberal-conservative divide. “The United States, through the ATS, has opted to impose civil compensatory liability on violators and draws no distinction in its laws between violators who are natural persons and corporations,” Leval concluded. In a decision this past July, the D.C. Circuit came to a mirror-image conclusion. Its two-judge majority agreed with Judge Leval. Dissenting Judge Brett Kavanaugh, a former clerk to Justice Anthony Kennedy and a George W. Bush appointee whose opinions hold some influence among the Court’s conservatives, endorsed the 2nd Circuit majority’s test. “It would be quite odd for a U.S. court to allow a customary international law-based ATS claim against a corporation when no international tribunal has allowed a customary international law claim against a corporation,” wrote Kavanaugh. Kiobel has so far flown under the radar in a term stacked with cases on the hottest political topics of the 2012 election cycle. In a sense, the posture of Kiobel resembles the health care cases, which also come with a 3-1 circuit court split in favor of the more typically “liberal” position. Unlike the long history of the Court’s commerce-clause case law relevant to the health care debate, however, there is paltry ATS precedent to check the justices’ political prejudices, be they for big business or international human rights. Should the Court break down on ideological lines with a narrow right-wing majority limiting ATS defendants to natural persons, no casual observer will be able to avoid the conclusion, rightly or wrongly, that the Court’s conservatives are eager to grant corporations powerful political rights while exempting them from the consequences of their most egregious behavior. Sure, such a divergence could be explained by pointing to distinctions between the First Amendment and a law that fuses federal and international tort law. But a decision for Shell Oil would still send the crude message that the Court believes corporate coffers are better spent influencing elections than compensating torture victims.